I spent a weekend in Valparaíso, the port of Santiago, 2 full hours away by bus. 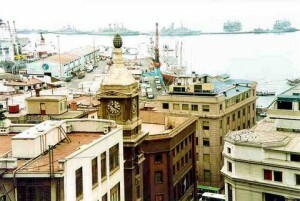 The port of Valparaiso seen from one of its many hills behind the Turri clock tower, where you can also find an English pub. 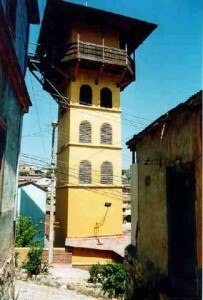 The exact point is reached via the Ascensor Turri dating from 1883, the oldest in the city. The fleet was there in force - and there were a few drunken brawls in the centre. I left a suitcase in my hotel in Santiago (30C) and went off with a hold-all and light clothing. Big mistake as ‘Valpo’ was 10C and foggy. First night my balls froze and I nearly died, so next day I bought a warm athletic sweater for £10 asap. Valpo is a port built by the British and has a nice menacing seediness. My hotel was in the red light district and had to fend off pros and TVs both nights I was there, but believe me, I know how. Valpo is exceptional in the way it is built as the city has spread in some enormous steep hills around the port which offer splendid photographic opportunities. About twenty lifts take you up the hills, like the elevadores in Lisbon. The city is also home to giant rats the size of piglets, which is why I went to Viña del Mar for dinner. Now Viña is the Torremolinos of South America – need I say more ? It’s twenty minutes by bus off Valpo and during my stay there was a song festival, a sort of Eurovision of the Latin world. (Italy won. The UK judge was Laura Brannigan – who?) The festival lasts about two weeks: only two songs are in competition every night and there is a show where each judge tops the bill in turn. It is extremely popular in South America, and it was on in all the bars’ and restaurants’ televisions, while I was there. Back in Santiago, I had a tour booked for the wineries around the capital, in the Valley of Maipó. This proved to be the first highlight of my trip. Not only were the tours informative, not only was the wine tasting excellent, but I got very friendly with my guide ( it was me and him) a 48-yr old Santianguino and discussed politics (life was not all roses under Allende), earthquakes (why are they building tall glass buildings in Santiago ? ), his life (his wife wants to leave him), marriage and divorce (which did not exist in Chile at the time, but it was easy to annul marriages). 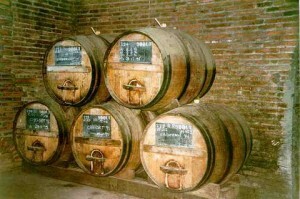 Cabernet barrels fermenting in the Cousiño Macul winery. As he spoke only Spanish, this also broke my Spanish fluency barrier. From then on I understood a lot and spoke it reasonably well. The wineries I went to where Cousiño-Macul and Concha y Toro. They take you to the original Casillero del Diablo Concha y Toro, (a brand you can easily find in the UK). This was the Devil’s Cellar, where the vine owner kept his best vintages but told the workers that it was haunted by the Devil. A tall story indeed, but very effective if you are Catholic. Wine worker who is afraid of the Devil, performs a quality test in the Concha y Toro winery. Since I only knew the Chilean reds I was surprised to find such excellent whites. So what do I recommend after having spent seven weeks during two trips in Chile overall?